See results in a fraction of the time with short, effective workouts: work smarter not harder! Let's HIIT It! 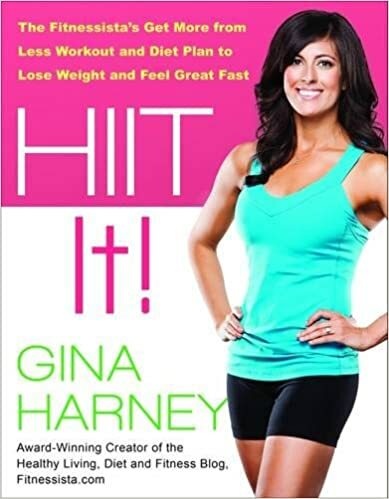 Gina Harney, award-winning creator of Fitnessista.com, knows high-intensity interval training (HIIT) is the smart alternative to long cardio workouts. With shorter workouts you can spend less time working out while building strength, coordination, and endurance and boosting your metabolism so you burn more calories throughout the day. And with her HIIT-inspired eating plan of frequent, tasty snacks, you'll feel great and stop stressing about food. "Full of helpful information for people looking to live a healthy lifestyle. I especially enjoyed her infectious enthusiasm for HIIT and reading her easy to follow sample fitness plans, exercise demonstrations with cues, and healthy recipes! "An excellent program that is lifestyle based and doesn't require hours in a gymÛperfect for someone like me! I adore that she loves food as much as she loves fitness. "A treasure÷HIIT It! presents Gina Harney's vision for a balanced, healthy lifestyle in the same upbeat, conversational manner that we have come to enjoy from her wonderfully popular blog. "An amazing resource for strong, effective, and quick workouts and tips for attaining balanced nutrition. And it's a super fun read. Highly recommended!